Some say this is the research park that started it all. Seen as a model of innovation, the Research Triangle Park (RTP) is arguably one of the most successful research parks in the world. RTP is home to more than 200 global companies, including IBM, GSK, Syngenta, RTI International, Credit Suisse, and Cisco, that foster a culture of scientific advancement and competitive excellence. 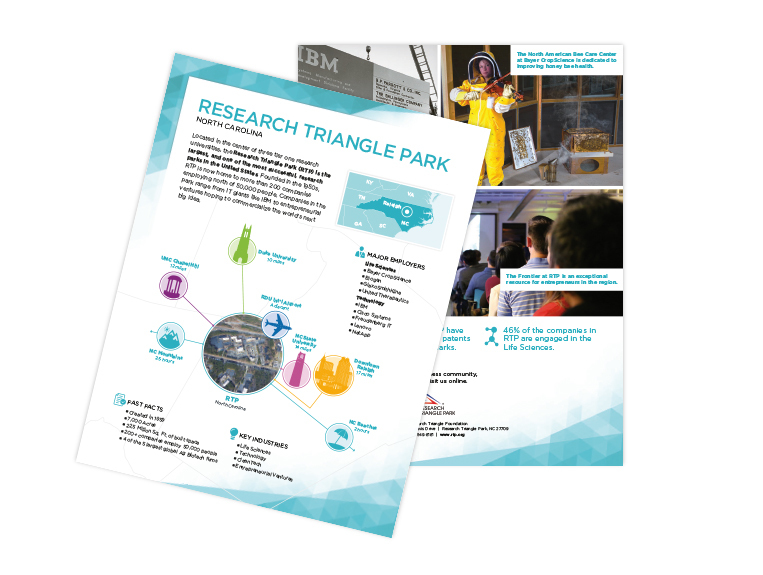 The Research Triangle Park is located between the region's three tier-one research universities: Duke University in Durham, North Carolina State University in Raleigh and the University of North Carolina at Chapel Hill. Industries invest more than $296 million in R&D at the region’s universities each year – double the average R&D investment for innovation clusters elsewhere in the nation. Visit the Research Triangle Park website for more information. North Carolina State University's Centennial Campus is also seen as a model research park-though for a different reason than the RTP. Centennial Campus is all about interaction and partnerships. In fact, companies located in this research park must have some type of partnership with the university. These partnerships range from student internships and co-ops to formal research agreements between industry and faculty. Visit the Centennial Campus website for more information.